Both are ex elected officials and Tagumenyos of the 1st District while the most endorsed gubernatorial bet of PDP-Laban Engr. “Kuya Edwin” Jubahib comes from Panabo City of the 2nd District. So, any of the two- ex-Vice Governor Victorio “Baby” Suaybaguio Jr and ex-Tagum City Mayor Rey T. “Chiong Uy” Uy is good match to Jubahib. At this writing, nobody has yet floated a name from PDP-Laban who will challenge for a party consensus or convention against Engr. Jubahib, who is the one anointed by ex-Speaker and 1st District Cong. Pantaleon “Bebot” Alvarez, although Uy had floated once to run for governor but most of the time he has been heard interested to run for vice governor either under PDP-Laban or the HNP. 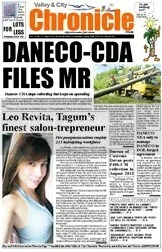 But he was apparently spurned already by HNP’s leaders in Davao del Norte – Gov. Anthony del Rosario and his father ex-Gov. Rodolfo “RDR” del Rosario. First, Uy expressed his interest to run for vice governor under HNP early this year to the Del Rosarios but Uy said he was “less in priority” as the governor instead used other people to tell him to run instead for Tagum City mayor. Suaybaguio, who took oath as PDP-Laban member last year before Cong. Bebot Alvarez inside his office Congress, on the other hand has been in fact invited to be in company in Alvarez-Jubahib sorties in barangays lately particularly in New Corella and San Isidro. Suaybaguio is accordingly hopeful he would be Alvarez’ pick, and had said in earlier interview that how he wish he would not rival in vice governor race against Uy, whom he said is his ijado. He had no answer to the query what post he would run to in the event that he would not be chosen as the Jubahib’s runningmate. Both Suaybaguio and Uy are good match to Jubahib. Suaybaguio, 77 years old, had been the Tagum mayor for 3 terms and vice governor for 4 terms, while Uy, 63 years old, had been a city mayor for 4 terms (elected in 1998, 2004, 2007, 2010). In his vice gubernatorial runs, Suaybaguio defeated his rivals each leaving them a deafening margin of over a hundred thousand votes. In 2001 polls Suaybaguio defeated ex-Boardmember Virgilio Boiser with a margin of over 124,000 votes. He defeated rivals Boardmember Shirley Belen Aala in 2007 and ex-Boardmember Roger Israel in 2010 leaving them wide margins of over 101,000 votes and over 150,000 votes, respectively. Truly a son of Tagum he won his first elective post as municipal councilor in 1980 and after a term he ran and won as the vice mayor before he completed his three straight terms as the municipal mayor from 1988 to 1998. Suaybaguio was the architect of the cityhood of Tagum as it was on his last term that he successfully labored to make Tagum a city worthy to be called as such for the 9 years of massive developments that the city had undergone under his leadership as shown in the market –terminal-slaughterhouse-road complex that he built and which bustles now in the inner northern frontier of the citywhich was once an wide agricultural, forested area. 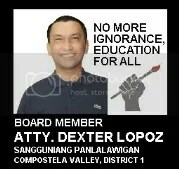 For three terms he was the president of the mayors’ league of still undivided Davao del Norte. In 1995 polls when Suaybaguio sought for his last term his complete slate- from mayoral and vice mayoral down to councilors’ candidates- was so unopposed with zero rival not even a nuisance independent candidate in sight, a record that is still unbroken until this date. In May 2011 interview of this reporter, Uy, then outgoing last-termer city mayor, was coy to the prospect of running for governor by 2013 polls after his third term, but he maintained his earlier stance of running for the post “if there’s vacancy,” that was, if present second-termer and partymate Governor Rodolfo del Rosario would not seek reelection. He recalled that throughout his long career as politician he never made “gatecrash” to a post that was still available for reelection bid by the current holder. “Wala sa akong ugali ang mangilog. Ako hinoon ang ginakalaban bisag pang last term na. (it’s not in my character to wrest a post. It’s me who’s always being rivaled even if I’m already running for last term),” he said referring to the May 10 polls where he was rivaled by ex-Cong. Arrel Olano and ex-Gov. Gelacio “Yayong” Gementiza. He recalled that when he ran for vice gubernatorial post in 1992 in the undivided Davao del Norte the post was open and there was no reelectionist for it. In that polls Mayor Uy, who was then a 36-year-old first-termer boardmember, dueled with political veteran Gementiza, who came from being the longest-reigning mayor of the then municipality of Tagum during Marcos time. Uy after losing in the polls went into a term of political forlough. “I went into farming, planting durian trees,” he said. By 1995 he went back to politics running for boardmember and won handily. By 1998 polls after the creation of Compostela Valley from Davao del Norte and the conversion of Tagum as a city, Uy ran for mayor as the post was open while Suaybaguio was ending his last mayoral term. He was rivaled by ex-Cong. Baltazar Sator, who was also ending his last term as District 1 congressman. Then Boardmember Antonio Lagunzad, coming from being the Tagum vice mayor, also joined in that mayoral contest. Uy won in a closely fought three-corner race, along with Vice Mayor Gerardo R. Racho. In his first reelection bid as city mayor in 2001 polls, he was opposed by Gementiza, who was then reigning as the vice governor of the smaller Davao del Norte. Uy lost again to Gementiza in the mayoral bout. In 2004 Gementiza did not seek reelection as he ran for governor leaving the mayoral post available and open. Uy regained his mayoralty seat running to the open mayoral post, and winning in a close bout with a comebacking Suaybaguio. (In that polls, meanwhile, Gementiza in tandem with then Cong. Anthony “AGR” del Rosario won as governor against then agriculture secretary Roberto Sebastian. The next 2007 local elections saw the reelectionist-tandem Mayor Uy and Vice Mayor Allan Rellon pitted against the opposition candidates Meliton D. Lemos and running-mate, Geterito T. Gementiza, with the Uy-Rellon tandem winning by a big margin of votes. The 2010 general elections saw again the Uy-Rellon tandem against First District congressman Arrel Olaño and the tandem of Gementiza-Aventurado. Uy and Rellon won by a landslide. From 2004 mayoral comeback of Uy, it would be pointed out that he won in series his second and third terms. He was always opposed by political somebodies in his two reelection bids. In 2007 polls, Uy was opposed lightly opposed by third- termer Councilor and lawyer Meliton Lemos, who allied with Gementiza, who sought reelection for governor against Gov. Del Rosario. In the last May 2010 polls Uy won handily by wide margins over two political veterans- outgoing Cong. Arrel Olano and ex-Gov. Gementiza. In sum, Uy throughout his political career broke an unprecedented record of defeating one governor, two congressmen and one vice governor. Comparatively, in terms of fighting veteran politicians the late stateman ex-Gov. and ex-Cong. Prospero Amatong and Gov. Del Rosario respectively defeated only one vice governor/ governor (Gementiza). The mayor added that politicians should respect each other referring to the way of not opposing last termers and not to be selfish enough for one’s personal interest like those last termers who loudly made big reason on their last term and ran to other post even if it is not vacant or occupied by a friend or partymate. He was giving thumbs up to the mayoral bid of his chosen political successor son senior city Councilor De Carlo “Oyo” Uy in the 2013 polls against Rellon. In that polls, Rellon trounced Oyo Uy by 21,964 votes’ margin. Rellon got 54,492 votes against Uy’s 32,528 votes. In the last 2016 elections, it was time for Chiong Uy to fight against Rellon after resting for a term. As Typhoon Ompong slams our shores and ground, I can smell there is winter in the air. Cool winds rustled through the leaves of the bamboo trees in my backyard, whistling through the tiny holes in my amakan wall. But since I’m in the south, far away from Ompong’s path, I could only feel a rushing wind than the biting wind and rains that might have been already lashing at the people in the north as this supertyphoon makes a landfall. From TV images, villagers scamper in evacuation sites; they writhe in pain. I could feel their grimace and collective fear, that is choking them each time the bamboo branches scratch my house roof. I can imagine a macabre scenes after the onslaught, heavens forbid. When TV images from live news reports come, the swaying trees and bushes amid the endless rains brought by furious Ompong winds have me lurching against the couch and the hazy, drizzling images on screen bring darkness to my room that swallows me. Only this solitary light of my cellphone gives me hope and radiance to pray there will be twittering of joyous birds in ravaged lands the next mornings after.